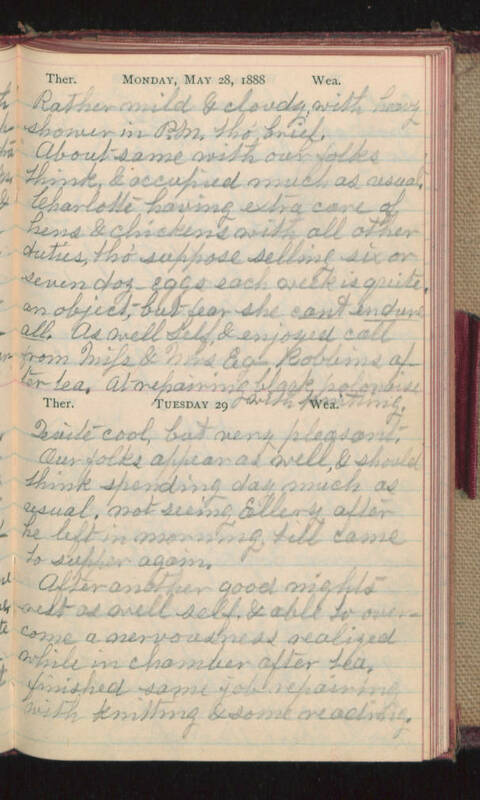 Monday, May 28, 1888 Rather mild & cloudy, with heavy shower in P.M. tho' brief. About same with our folks think, & occupied must as usual. Charlotte having extra care of hens & chickens with all other duties, tho' suppose selling six or seven doz- eggs each week is quite an object, - but fear she can't endure all. As well self, & enjoyed call from Miss & Mrs Eg- Robbins after tea. At repairing black polonaise with knitting. Tuesday 29 Quite Cool, but very pleasant. Our folks appear as well, & should think spending day much as usual, not seeing Ellery after he left in morning, till came to supper again. After another good nights rest as well self & able to overcome a nervousness realized while in chamber after tea finished same job repairing with knitting & some reading.